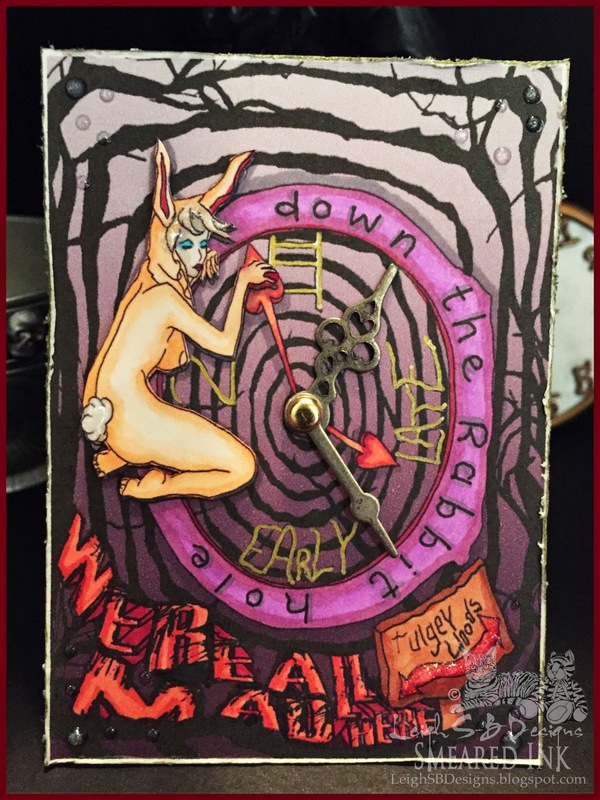 Velvet Paw Creations: Down The Rabbit Hole ATC - DT Smudgy Antics! It's my turn again to share some DT inspiration on Wednesday on our Smudgy Antics Challenge blog! I'm getting my project up a bit earlier coz I'm also playing in the Smeared and Smudge monthly member blog hop "Alice in Wonderland - Madness" on Thursday. Lots going on so let's get started! 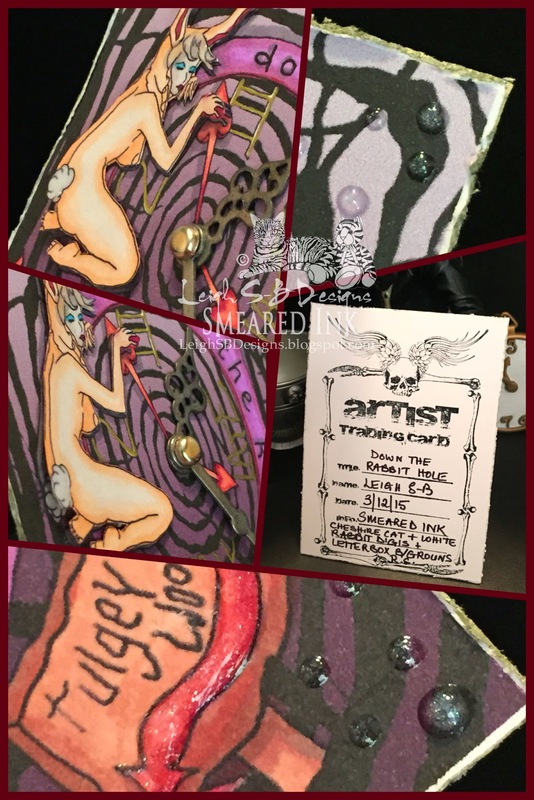 I used Smeared Ink's Cheshire Cat and White Rabbit digis from the Wonderland set and on the back I stamped the ATC Info stamp from the Letterbox Backgrounds rubber set. Clocks have 4 hands in Wonderland, no one has a clue what time it is! I performed some Wonderlandian magic in Photoshop CS6 and made the Cheshire Cat disappear from the background image, filled in the design, added a purple gradient sky and altered the shape from round to ATC sized. 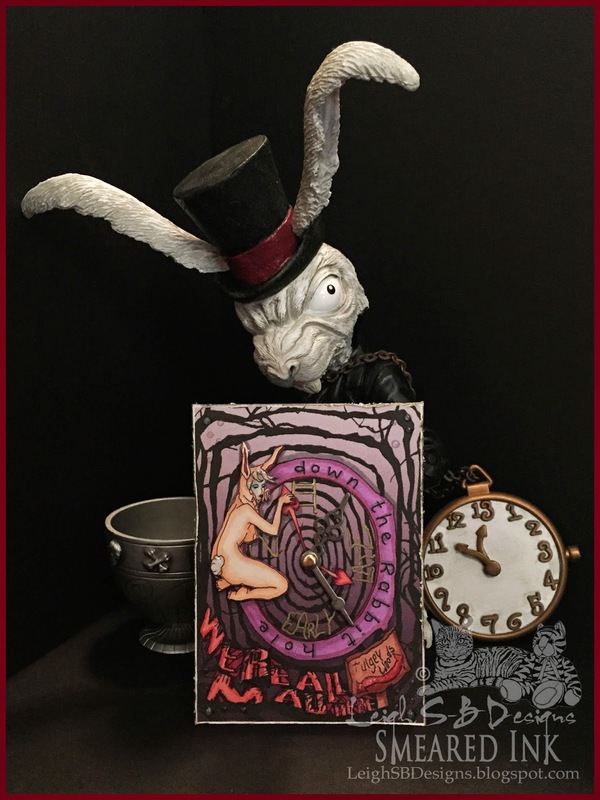 I also removed parts of the design on the White Rabbit image and overlaid the Rabbit and a portion of the clock onto the background before printing it out on white cardstock. I then printed out just the rabbit. I coloured everything with Copics and fussy cut out the Rabbit and layered her onto the ATC with dimensional silicone glue. I added metallic gold detail to the clock text and another set of metal clock hands attached with a tiny brass brad. I hand wrote the "down the Rabbit hole" text with a black fineliner Copic marker and distressed the edges of the ATC with Tim's Tonic tool and edged it in metallic gold. For the finishing touch I added some sparkle with a Vive Pearl Transparent Magic White dimensional pen on the Rabbit's tail, hair, the arrow on the sign and some dots in the corners. The ATC Info image was stamped with black Archival Ink onto another ATC and I adhered it to the back with Scotch Quick Dry adhesive. There's also still lots of time to play in our Smudgy Antics "Always Anything Goes" challenge this month AND don't forget about the Lost Coast Designs "50 Shades of GREEN" readers progressive blog hop I'm hosting this month! Hop all the blogs already up, get inspired and join the hop yourself for the chance to win a $20 gift certificate to spend at Lost Coast Designs! Click the banner below for all the details on how to play and win! Your art is always outstanding Leigh!